The City of Huntington Woods sits at the southeast corner of Oakland County and is roughly 17 miles northwest of Detroit. Originally part of the Township of Royal Oak, Huntington Woods was incorporated into a village in 1926 and then into a city in 1932. Huntington Woods is the majority home of the Detroit Zoo, which draws in visitors from all around Michigan. Not only is the Detroit Zoo the home of a wide variety of exotic animals, it also has camps for kids and programs for school groups. The zoo is fun place to go during the warm months, but it’s also open year-round for those who don’t mind the cold. Golfing at the Rackham Golf Course is another fun activity that the residents of Huntington Woods enjoy. The Rackham was designed by Scottish architect, Donald Ross, a famous golfer and course architect from the early 1900s. He was known for designing challenging courses without the need to excavate much earth. His course is a great place to spend a Saturday afternoon. If you’d like to learn more about the area, please visit the City of Huntington Woods website here . The photo at the top of the screen is of a Huntington Woods style addition of ours. 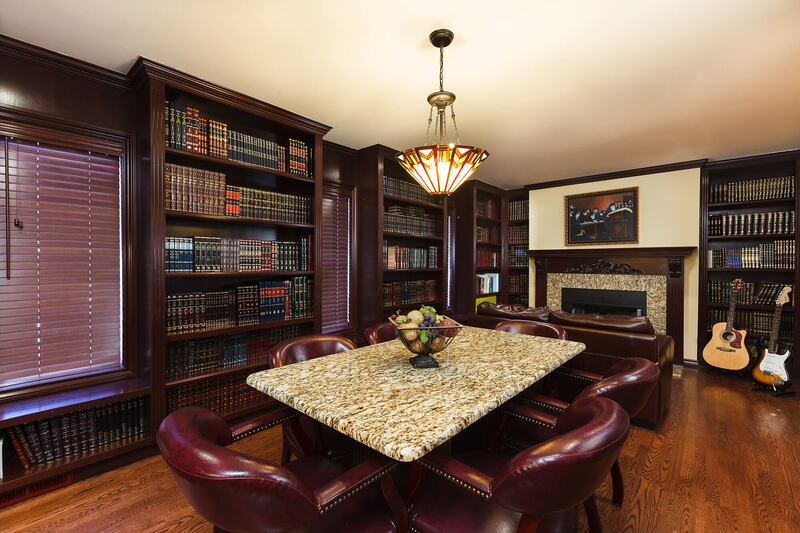 We built this beautiful study room as part of an addition on the house. We then installed dark wood shelves and built a picturesque fire place where the homeowner can sit and read by the fire after a long day. The photo just above is of a Huntington Woods Style bathroom remodel of ours. We built a custom tub deck and installed a tile backsplash around the bathtub. We then extended the tub deck to be used as a shower bench and tiled the shower wall with matching tile.